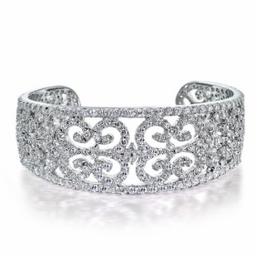 Sposabella-COUTURE cuff cz bridal bracelet - SALE! HOME / BRIDAL JEWELRY / Wedding Bracelets / Sposabella-COUTURE cuff cz bridal bracelet - SALE! Description: Beautiful Silver-Clear vintage style cuff cz bridal bracelet. Pure elegance for that unforgettable day. fits all wrist sizes.